The "Towercam" at the top of the Mt. Wilson solar observatory tower captured this image tonight. The facility's Internet connection had been broken for several days having been burned out by an intentionally-set backfire. 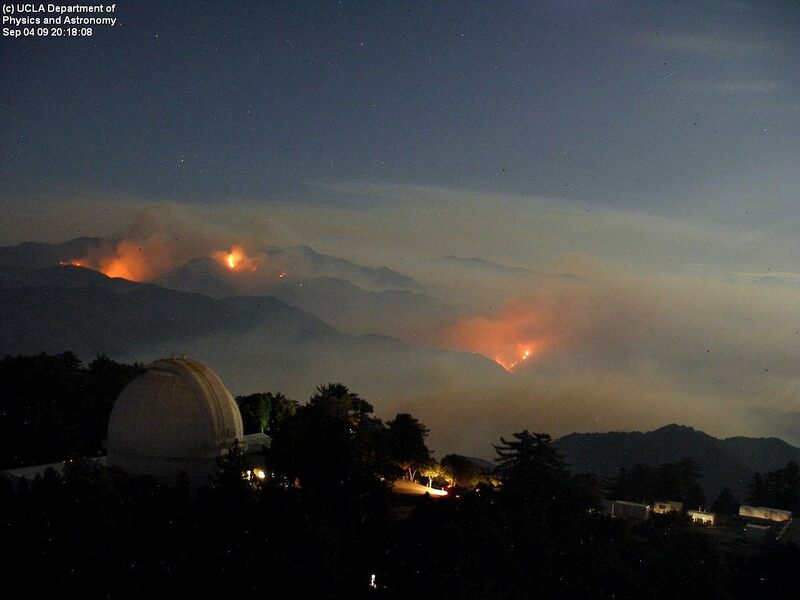 Tonight the Observatory remains under threat but the degree of danger is believed to be lower now than in recent days. Mt. Wilson is, among other things, the place where Edwin Hubble did much of his groundbreaking work. It is also a modern astronomical research center. The situation is being chronicled in a blog by Mt. Wilson personnel. Image: "Towercam," UCLA Dept. of Physics and Astronomy; quality adjusted by JG. Terrifying but strangely beautiful. I wonder if an observatory on Mars would look like that?